For the historic house, see Haleʻākala. Haleakalā ( /ˌhɑːliˌɑːkəˈlɑː/; Hawaiian: [ˈhɐlɛˈjɐkəˈlaː]), or the East Maui Volcano, is a massive shield volcano that forms more than 75% of the Hawaiian Island of Maui. 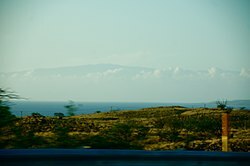 The western 25% of the island is formed by another volcano, Mauna Kahalawai, also referred to as the West Maui Mountains. Early Hawaiians applied the name Haleakalā ("house of the sun") to the general mountain. Haleakalā is also the name of a peak on the southwestern edge of Kaupō Gap. In Hawaiian folklore, the depression (crater) at the summit of Haleakalā was home to the grandmother of the demigod Māui. According to the legend, Māui's grandmother helped him capture the sun and force it to slow its journey across the sky in order to lengthen the day. 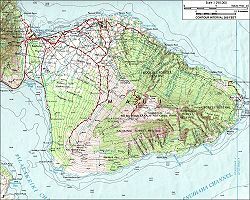 Until recently, East Maui Volcano was thought to have last erupted around 1790, based largely on comparisons of maps made during the voyages of La Perouse and George Vancouver. Recent advanced dating tests, however, have shown that the last eruption was more likely to have been in the 17th century. These last flows from the southwest rift zone of Haleakalā make up the large lava deposits of the Ahihi Kina`u/La Perouse Bay area of South Maui. Contrary to popular belief, Haleakalā crater is not volcanic in origin, nor can it accurately be called a caldera (which is formed when the summit of a volcano collapses to form a depression). Scientists believe that Haleakalā's crater was formed when the headwalls of two large erosional valleys merged at the summit of the volcano. 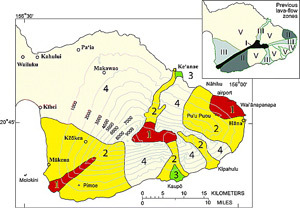 These valleys formed the two large gaps — Koʻolau on the north side and Kaupō on the south — on either side of the depression. 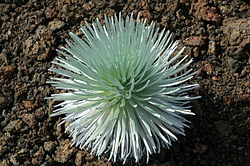 This rare species of Silversword is fragile and lives only upon the slopes of Haleakalā. Surrounding and including the crater is Haleakalā National Park, a 30,183-acre (122.15 km2) park, of which 24,719 acres (100.03 km2) are wilderness. 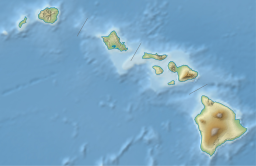 The park includes the summit depression, Kipahulu Valley on the southeast, and ʻOheʻo Gulch (and pools), extending to the shoreline in the Kipahulu area. From the summit, there are two main trails leading into Haleakalā: Sliding Sands Trail and Halemauʻu Trail. Because of the remarkable clarity, dryness, and stillness of the air, and its elevation (with atmospheric pressure of 71 kilopascals (530 mmHg) ), as well as the absence of the lights of major cities, the summit of Haleakalā is one of the most sought-after locations in the world for ground-based telescopes (though to a lesser extent than Mauna Kea on neighboring Hawaii). 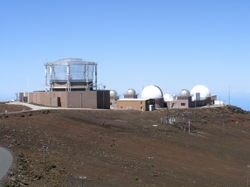 As a result of the geographic importance of this observational platform, experts come from all over the world to take part in research at " Science City", an astrophysical complex operated by the U.S. Department of Defense, University of Hawaii, Smithsonian Institution, Air Force, Federal Aviation Administration, and others. A well traveled Haleakalā Highway, completed in 1935, is a road mainly composed of switchbacks that leads to the peak of Haleakala. The road is open to the public (although parts of it are restricted) and is a well-maintained two-lane highway containing many blind turns and very steep dropoffs. Local animals, including cattle, are often encountered in the roadway. The Park Service charges a vehicle entrance fee of $25 (US). Public transportation does not go through the park, but tour buses visit the summit regularly. Haleakalā's summit experiences a cold-summer Mediterranean climate ( Köppen classification Csc), one of the few locations in the world with this climate type. The Haleakalā Ranger station, at a lower elevation, lies in the subtropical highland climate zone. ^ HVO, Hawaiian Volcano Observatory. "East Maui volcano (Haleakala), Hawai'i". usgs.gov. ^ USGS. "Current Alerts for U.S. Volcanoes". usgs.gov. ^ In its prime, Haleakala may have reached a height of 12,000 feet before water and wind erosion, and possibly glaciers, began to carve two large river valleys out of the rim. Eventually, these valleys formed gaps that merged at the volcano summit to create a crater-like basin. ^ "Youngest lava flows on East Maui probably older than A.D. 1790". United States Geological Survey. September 9, 1999. Retrieved 2011-12-11. ^ a b "How do Maui lava-flow hazard zone numbers compare to those on Hawaii island?". Lava-Flow Hazard Zones, Island of Hawai'i, Frequently Asked Questions. USGS. ^ a b c This article incorporates public domain material from the United States Geological Survey document: "Geologic hazards on Maui". 1996-11-27. ^ "Park Management". Haleakalā National Park. National Park Service. Retrieved 2010-10-26. ^ Decker, Robert; Decker, Barbara (2001). Volcanoes In America's National Parks. New York: WW Norton & Company Inc. p. 133. ISBN 978-962-217-677-5. ^ Robert Lemos (2008-11-24). "Giant Camera Tracks Asteroids". Technology Review ( MIT). Retrieved 2008-12-06. ^ Duensing, Dawn E. (2009). "Haleakalā Highway". Journal of Pacific History. 44 (3): 303–324. doi: 10.1080/00223340903356864. ^ "National Park Service suspends popular Hawaii bike tour". Associated Press. 2007-10-10. ^ "Data Tools: 1981-2010 Normals". National Oceanic and Atmospheric Administration. Retrieved 16 March 2016. ^ "Haleakala Summit 338, Hawaii (511008)". Western Regional Climate Center. Retrieved 3 Nov 2016. "Official Website". Haleakalā National Park. Retrieved March 22, 2018. Macdonald, Gordon A.; Abbott, Agatin T.; Peterson, Frank L. (1983). Volcanoes in the Sea. Honolulu: University of Hawaii Press.